This summer the Dodd Research Center Gallery exhibits Season 1 of d’Archive, the archives podcast hosted by WHUS campus radio. 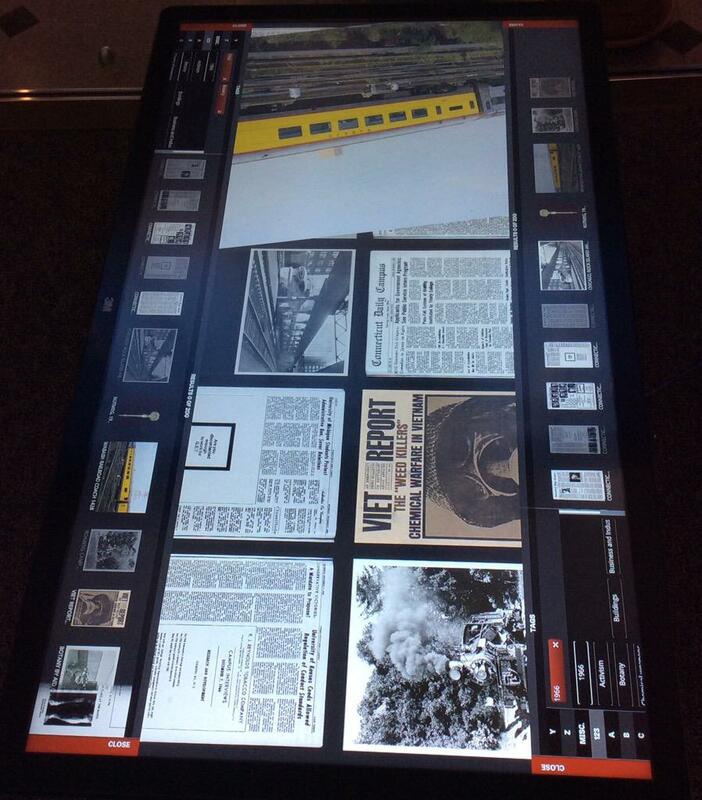 After wrapping up a 15 episode season over the course of Fall 2017 and Spring 2018 semesters, which is available on itunes or wherever you catch podcasts, materials featured on the show are currently on display. Dr. Michael Kindellan is a Vice Chancellor’s Fellow at the University of Sheffield, UK. He has published research articles on several 19th and 20th century Anglo-American poets, and has recently completed a book on Ezra Pound’s late cantos (to be published in September by Bloomsbury). Made possible by a generous a Strochlitz Travel Grant, in January he travelled to the Archives and Special Collections at the Dodd Research Center to consult the Charles Olson Research Collection, along with other, related collections, such as the Ed Dorn, John Wieners, Michael Rumaker, Fielding Dawson and Ann Charters Papers. This trip marks the beginning of work on his new project, tentatively called “Present Knowledge: Charles Olson and the Poetics of Pedagogy”. I have been meaning to begin this project since late 2011, when I was first awarded a Strochlitz Travel Grant. Sadly, I was forced to defer that in favour of a temporary lectureship position. One thing led to another, and two intervening post-docs later, I am thrilled to have been afforded the time and opportunity, both by Sheffield and by UConn, to properly get started. Charles Olson [FIG. 1] was a poet and a pedagogue. He began his teaching career at Clark University in the mid-1930s. In 1938, he took up a Guggenheim Fellowship in support of research on Herman Melville, leading to the publication of Call Me Ishmael. During the 1940s Olson also worked in various positions for the US Government: as Associate Chief of the Foreign Languages Division for the Office of War Information and as Foreign Nationalities Division Director for the Democratic National Committee). In the late 1940s, partly on account of his poetic debut Y & X (in collaboration with the Italian artist Corrado Cagli) and partly after a strong recommendation from Edward Dahlberg, Josef Albers invited Olson to give a series of classes on writing at Black Mountain College, where he eventually took up a permanent position before becoming its rector until its closure in 1957. [FIG. 2] These academic posts were followed by others in the 1960s, initially at SUNY Buffalo and then at the University of Connecticut. Olson’s reputation as poet/theorist was secured by his seminal 1950 essay “Projective Verse”; from that point on, he wrote poems until the day he died. With that in mind, setting his poetics (the theory and practice of verse composition) in relation to his pedagogy (the theory and practice of teaching) seems an obvious thing to do. However, my project attempts something slightly more ambitious, namely to read Olson’s poetics and pedagogy as both complementary and also as coincident undertakings. Some of Olson’s comments in the minutes of BMC faculty meetings, where the subject of conversation is how best to go about teaching, often sound exactly like his ideas concerning good writing practice and procedure; similarly, his verse is frequently didactic in tone and instructional in form. Just how Olson’s prosody can be seen to issue the reader with “instructions” is the subject of an essay I published in Contemporary Olson (Manchester UP, 2015), a work that serves as a starting point the larger project at hand. Throughout, I mean to argue that Olson’s ideas and methods of writing are identical to his ideas and methods of teaching, and to explore the consequences of that. As Eleanor Berry and Alan Golding have recently suggested, Olson sought to extend “his formal concerns into the epistemological realm in arguing that projective verse involves a ‘stance towards reality’ that he labels ‘objectism’”. Olson understood “objectism”, Berry and Golding rightly note, as the “getting rid of the lyrical interference of the individual as ego”, which they describe as “an ethically anti-humanist move to take poetry beyond mere self-expression into more culturally capacious realms of statement”. As a poet as well as a teacher, Olson might well have wanted to strip away all traces of the “individual as ego”, but it is not necessarily how he went about the actual business of either teaching or writing poems. Indeed, a good deal of archival material demonstrates that, in actual and historical fact, Olson’s methods are highly egoistic, often radically so (where by “egotistic” I do not mean “excessively conceited”, but rather interested in the “self” as a foundation for both practice and comportment). Consider, as a case in point, the exam questions he set for students taking his 1964 “Literature and Myth” course at SUNY Buffalo. Question 4 in particular, which begins “My own belief is that…”, demonstrates the extent to which Olson exerted strong control over the parameters of whatever horizons of understanding his students operated within. [FIG. 3] By all accounts, Olson was, as his long-time correspondent J. H. Prynne recently put it, “an influential and powerful teacher”; but he and his “Black Mountain team”, Prynne goes on to contend, “practised ascendency over the students and dominated their development, and offered themselves as exemplary models to be followed, not as choices to be made”. 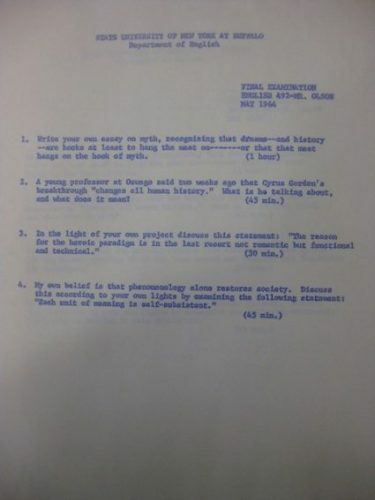 This assessment is consistent with reports given by Olson’s actual students who never quite fell under his spell, such as Francine du Plessix (later Gray); likewise, Olson’s often bad tempered and downright condescending notes to Cid Corman in Letters for Origin portray an authoritative teacher who suffered dissent badly. Charles Boer also reported, speaking to Olson in the second person, “your classrooms were for your ideas. If a student thought otherwise, he was soon set straight on the matter”. The question for me is, how to square this authoritarian streak with Olson’s anarchic, deeply anti-technocratic approaches to teaching and writing. In regards to both he admonished students and burgeoning writers to practice “istorin’”, an activity he attributed to Herodotus’s historiography and defined as “finding out for yourself”. The implications of this are far too numerous to encapsulate here, but foremost amongst them is Olson’s total refusal of conventional curricula: Olson was profoundly skeptical about lesson plans and learning outcomes, all of which promised to curtail in advance any line of inquiry that organically emerged from the pedagogical process itself. 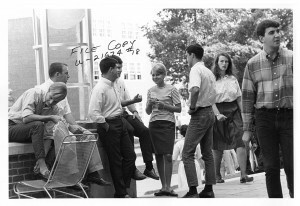 Several former students of Olson’s recount how he would habitually stay after class to study the chalk board, as though trying to make sense of what had happened, what was said. In “FIELD COMPOSITION”, or “projective verse” practice, the poet “puts himself in the open—he can go by no track other than the one the poem under hand declares, for itself”. 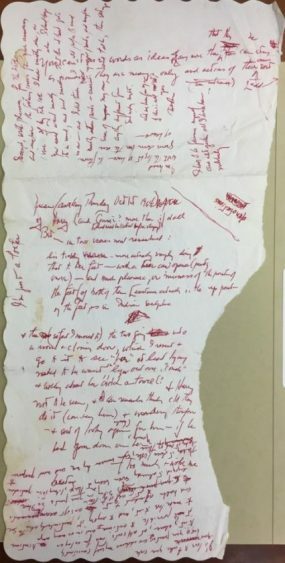 The archive also contains a great bulk of correspondence, written both by Olson, especially in his capacity as Rector of Black Mountain College, and by hundreds of correspondents, many of whom either taught with Olson (such as Robert Duncan and Robert Creeley) or were taught by him (such as Dorn, Dawson and Wieners). These letters have an obvious historical importance, given the established reputations of Olson’s peers. Of equal if rather different interest are letters Olson wrote to and received from lesser known interlocutors: officers at funding bodies, benefactors, university administrators, invitees to BMC’s summer “institutes” programme and parents of students. I expect many of these to feature significantly in my completed work. Naturally the manuscripts and other pre-publication material of the poetry—those pertaining to The Maximus Poems particularly—will feature throughout my work as well. 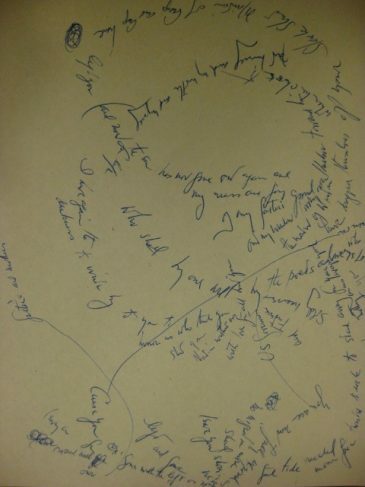 The first drafts of Olson’s poems, written mostly in longhand and sometimes to spectacular effect [FIG. 6], demand readers reassess the value and importance of the typewriter to this work. But it’s the less glamorous reaches of the archive that have thrown up the most interesting preliminary findings. 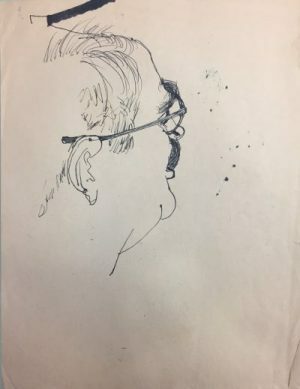 Fielding Dawson Drawing of Charles Olson (ink on paper), Fielding Dawson Papers. 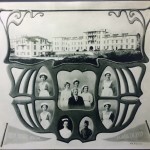 Archives & Special Collections at the Thomas J. Dodd Research Center, University of Connecticut Libraries. Black Mountain Ephemera, Fielding Dawson Papers. Archives & Special Collections at the Thomas J. Dodd Research Center, University of Connecticut Libraries. Series III, Box 268. Charles Olson Research Collection. Archives & Special Collections at the Thomas J. Dodd Research Center, University of Connecticut Libraries. Series III, Box 259. Charles Olson Research Collection. 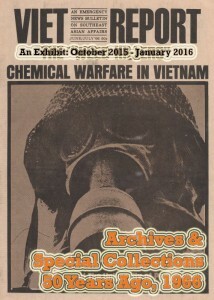 Archives & Special Collections at the Thomas J. Dodd Research Center, University of Connecticut Libraries. Series I, Box 26. Charles Olson Research Collection. Archives & Special Collections at the Thomas J. Dodd Research Center, University of Connecticut Libraries. Series I, Box 5, Folder 273. “I have been an ability—a machine”. Charles Olson Research Collection. 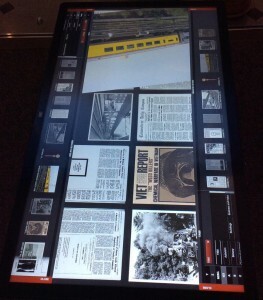 Archives & Special Collections at the Thomas J. Dodd Research Center, University of Connecticut Libraries. Josef Albers, 24 September 1948 Letter to Charles Olson, Series II Box 124, Charles Olson Research Collection. 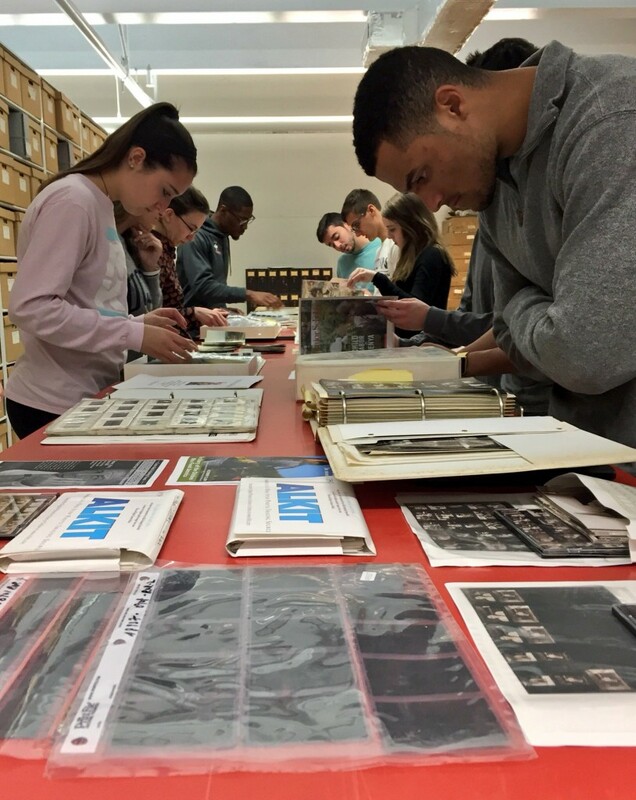 Archives & Special Collections at the Thomas J. Dodd Research Center, University of Connecticut Libraries. Eleanor Berry and Alan Golding, “Projective Verse”, The Princeton Encyclopedia of Poetry and Poetics, 4th ed., ed. Roland Greene et al, (Princeton: Princeton University Press, 2012), 1109. J. H. Prynne, “The Art of Poetry No. 101”, The Paris Review 218 (Fall 2016): 183. Charles Olson, Letters for Origin: 1950-1956, ed. Albert Glover (London: Cape Goliard, 1969). Charles Boer, Charles Olson in Connecticut (Chicago: Swallow Press, 1975), 54. 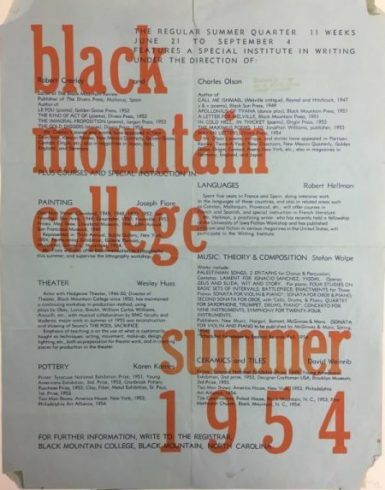 As Martin Duberman reports, John Cage esteemed Olson’s Black Mountain College a truly anarchic community, in contradistinction to Josef Albers’s, where the “anarchic feeling… was only on the surface”. Martin Duberman, Black Mountain College: An Exploration in Community (Evanston: Northwestern University Press, 1972), 367. Cf. 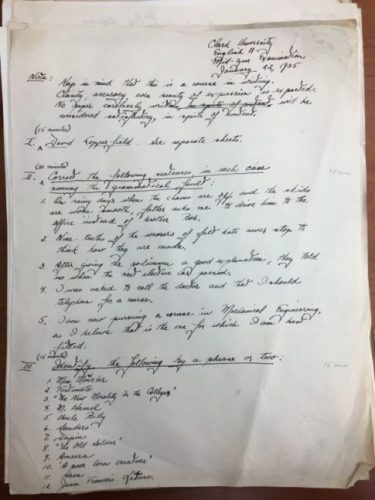 Olson’s statements on the matter in “Minutes of a Meeting of the Black Mountain College Faculty, 1951”, Olson: The Journal of the Charles Olson Archives 2 (Fall 1974): 16-24. Charles Olson, “Clark University English II Mid-Year Examination, Series III Box 258, Charles Olson Research Collection. Archives & Special Collections at the Thomas J. Dodd Research Center, University of Connecticut Libraries. Currently being installed in the Thomas J. Dodd Research Center Archives & Special Collection’s Gallery, an exhibit We are the Armenians. A two month community exhibition celebrating the history, strength, vibrancy, and accomplishments of New England’s Armenian American community. 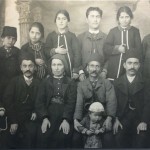 Commemorating the 100th anniversary of the Armenian genocide, the exhibition will showcase artifacts, photographs & family heirlooms belonging to members of Connecticut’s Armenian community and the Armenian Museum of America (Watertown, MA). We are the Armenians, an exhibition sponsored by UConn Global Affairs, is part of the 2015 Norian Armenian Community Exhibition Project. 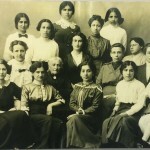 This project aims to provide a forum for individuals from the Armenian American community throughout Connecticut and the greater New England region to record, share, and preserve their stories, and in so doing, to contribute to the understanding of themes relating to immigration, cultural diversity, and identity relevant to the Armenian diaspora. 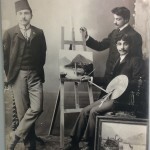 The historical foundation of this outreach program was established with the Norian Armenian Oral History Project, directed by Bruce Stave and Sondra Astor Stave, which encompasses twenty interviews, archived in the Connecticut Oral History Collection in UConn’s Archives and Special Collections at the Thomas J. Dodd Research Center. 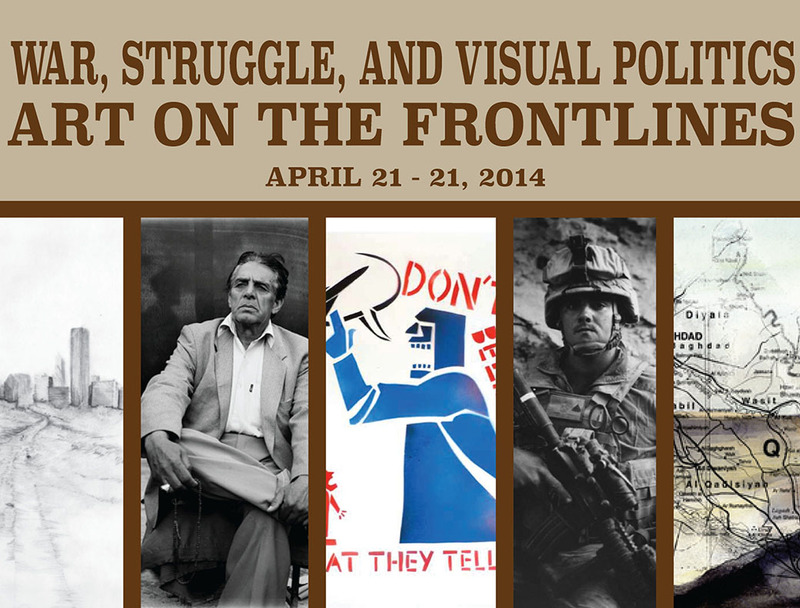 The Archives and Special Collections in collaboration with the Dodd Center and Booklyn Artists Alliance, are hosting two days of events on War, Struggle and Visual Politics: Art on the Frontlines. Events will be held in the Dodd Research Center on April 21st and 22nd in conjunction with the Week In Humanities. Artists Seth Tobocman, Stephen Dupont, Marshall Weber, Chantelle Bateman and Aaron Hughes will be holding talks, workshops and presenting artwork around the focus of politics and activism in art and war. Students, community members, veterans and artists are encouraged to attend these events to provide a dynamic facilitation of how we utilize art, activism and memory to cope with war. For a full list of events, please follow this link for the Week in Humanities. On October 4th and 5th, the red coats are coming to UConn! This years annual meeting of the Northeast Conference on British Studies, organized by Prof. Brendan Kane of UConn’s History department, is working collaboratively to promote historical research in archival collections. 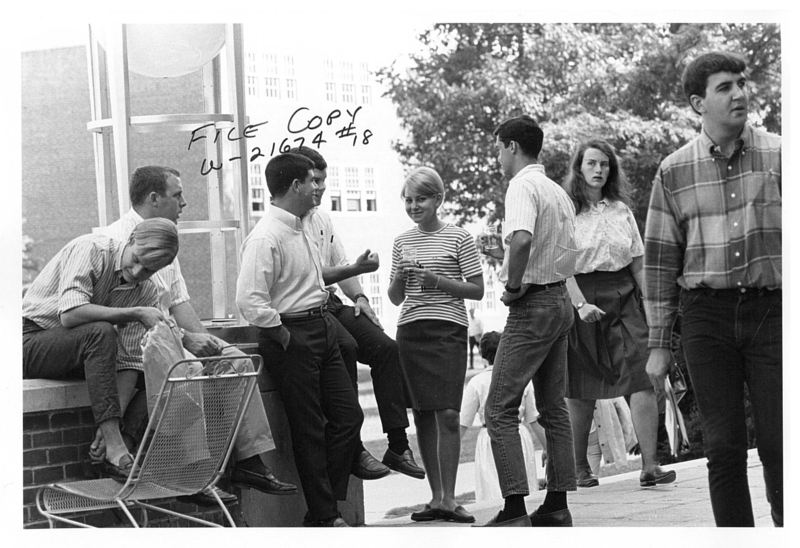 The Dodd Center and Archives & Special Collections will be on display the evening of October 4th for the initial day’s reception. 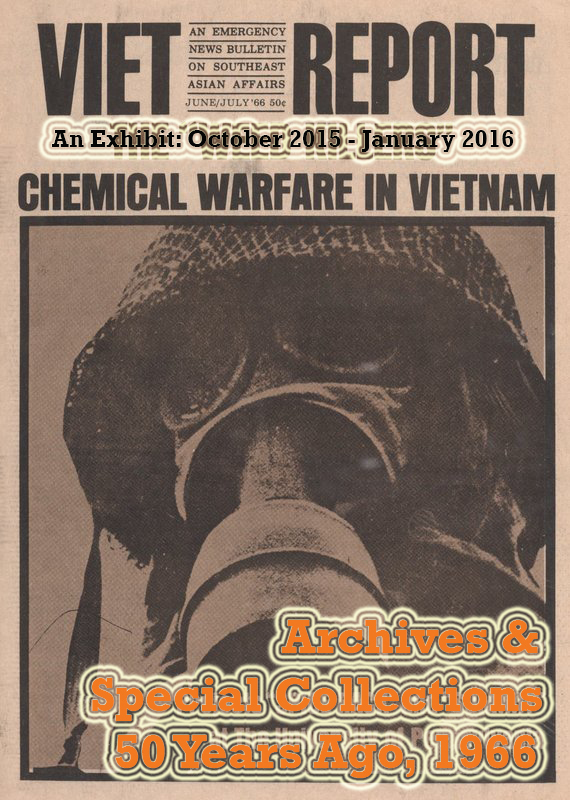 Archives & Special Collections will have materials on display from the early modern period to anti-colonial struggles of the late twentieth century. The Northeast Children’s Literature Collection mourns the loss of our good friend, Marc Simont. Mr. Simont placed a significant amount of his work here and joined us at the CT Children’s Book Fair four times between 1993 and 2002. He was talented, charming and witty, and will be sincerely missed. Marc Simont was born November 23, 1915, in Paris, France to Joseph and Dolores Simont from the Catalonian region of northeastern Spain. 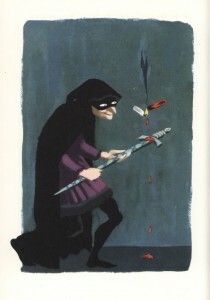 Joseph was an illustrator and artist/reporter for L’Illustration in Paris. Because his parents moved frequently Marc attended schools in Paris, Barcelona, and New York and became a U.S. citizen in 1926. 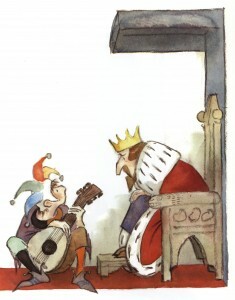 Though he later attended art schools he considered his father his greatest teacher. He studied art in Paris at Académie Julian, Académie Ranson, and Andre Lhoté School. In the U.S. he attended the New York National Academy of Design and Jerry Farnsworth’s summer school in Provincetown, Mass. He worked as assistant to mural painters Francis S. Bradford (1939 N. Y. World’s Fair) and Ezra Winter (Library of Congress). The Happy Day by Ruth Krauss (HarperCollins, 1949). 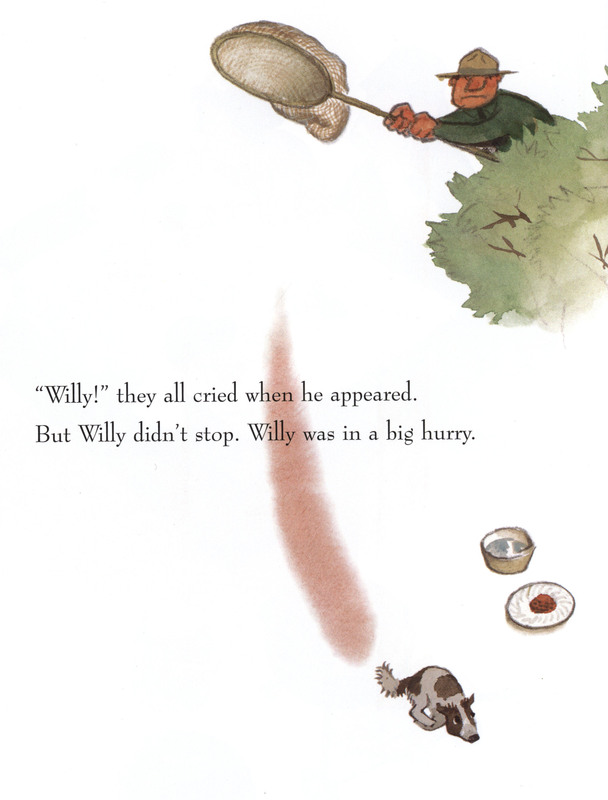 The 13 Clocks by James Thurber (Simon and Schuster, 1950). 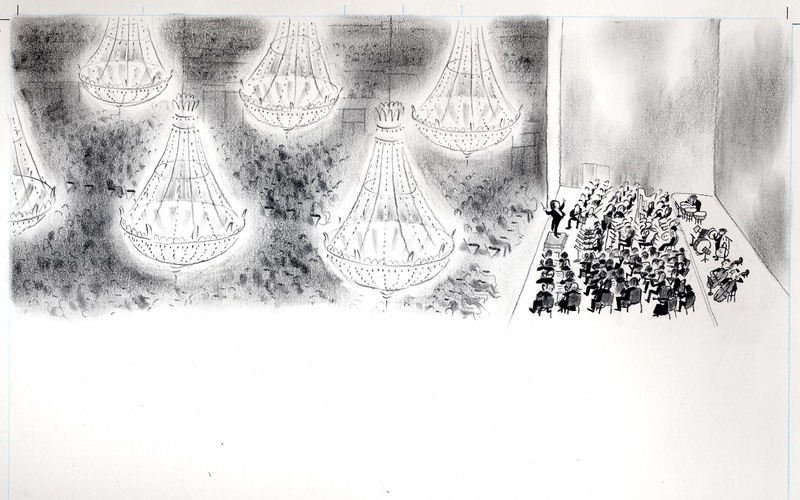 The Philharmonic Gets Dressed by Karla Kuskin (Harper and Row, 1982). A wonderful story about Simont is retold in his obituary which appeared in the New York Times on July 16, 2013. Simont and Robert McCloskey lived together in Greenwich Village when McCloskey was working on his classic Make Way for Ducklings. 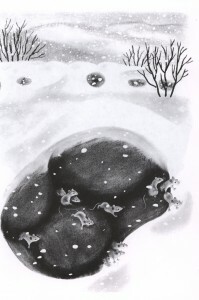 In order to study ducklings more thoroughly for his drawings and with Simont’s assent, he brought home a family of ducklings which lived in the bathtub for several months. Rest in peace, Mr. Simont. Established in 2004, the Terrence Webster-Doyle Papers contain materials having to do with bullying prevention, conflict management, peace studies, emotional response, and how psychological conditioning prevents peace and creates conflict, individually and globally. Influenced by Jiddu Krishnamurti in 1968, Webster-Doyle began to teach classes at Sonoma State University in the search for understanding the cause, nature, and structure of conditioning. Webster-Doyle also studied the work of Dr. David Bohm, a physicist who studies the relationship between thought and reality; A. S. Neil, the founder of the Summerhill School, an intentional community in England; and Aldous Huxley, author of Brave New World which explored the nature and effect of negative conditioning. Webster-Doyle is a sixth Dan in Take-Nami-do karate, and utilizes his extensive martial arts experience as a focus for the exploration of the nature of conflict and its ramifications for the individual, schools, society and the world. With his wife Jean, they founded the Atrium Society and its subgroups, Martial Arts for Peace, Youth Peace Literacy Project, and Education for Peace (http://martialartsforpeace.com/index-2.html). His published works usually contain not only a main work but also guides for students, teachers, martial arts instructors, and parents, with worksheets, group and individual activities, with tools to chart progress in conflict resolution. Webster-Doyle’s books, archives, and audiovisual materials are held by the Northeast Children’s Literature Collection. His books are also on permanent display at the International Museum of Peace and Solidarity in Samarkand, Uzbekistan, the Commonwealth of Independent States and at the Hiroshima Peace Memorial Museum in Japan. The planning committee for the CT Children’s Book Fair is already busy lining up presenters and programs for the 21st Fair to be held on the Storrs campus on November 10-11, 2012. So far we’ve lined up Patricia MacLachlan, author of Sarah Plain and Tall and many other great books; Robert Sabuda, the paper engineer par excellence and creator of marvelous pop-up books; Barbara McClintock, author and illustrator of the award-winning Adele and Simon books; and Katie Davis, author and illustrator of Little Chicken’s Big Day, which won the 2011 Trailee Award. 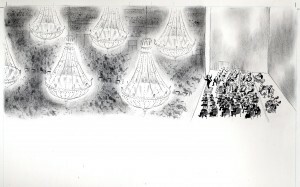 The exhibit in the Dodd Center’s Gallery From October 2012 to February 2013 will showcase Katie’s archives which are housed in the Northeast Children’s Literature Collection. We’re considering presenting a panel on bullying in addition to the panel on literature for teens, which has been popular for the last two years. Breakfast with Clifford will of course be a highlight both Saturday and Sunday mornings. For more information get automatic updates from the Fair’s Facebook page.